This is quite exciting to have Open Source gurus coming to present to the Oracle conference, and explain how to use the new Spring in their projects or leverage Open Source practices to improve development in house… Take a look to the full program of Oracle Develop. Start to use the Oracle OpenWorld Schedule Builder to organize your week in SF, if you have not registered yet for OOW click here. If like me you like scripting technologies and in particular Groovy and Grails, JavaOne 2006 will be a very good moment to learn more about it. If you are not familiar at all with Ruby On Rails, it is important to notice that it has nothing to do with Java, J2EE. It is a Ruby based framework. So yes Ruby On Rails is really interesting, powerful and so on… but for me as a Java developer I would like to do the same using Java (or equivalent) leveraging the investment that I have done in J2EE; also important I want to be able to deploy and manage applications that are developed this way using my tools such as Oracle Enterprise Manager Application Server Control. The paradigm “coding by convention” that is the driver of Ruby on Rails has been leveraged to developed a new framework: GRAILS. Grails uses Groovy as the underlying language, so it runs on a JVM and can leverage any existing Java API. If you are a Java developer you will find very interesting to use this framework to accelerate the development of Web applications. If you are not yet a Java developer but need to develop Web application faster, and deploy the to your J2EE application server, Grails is also a very good tools. Groovy is a dynamic language that leverage features from other languages such as Ruby, Jython, and Smalltalk. Groovy is running at the top of a Java VM and makes available any existing Java objects (so all the API) to Groovy. Groovy is currently under standardization with the JSR-241. You can learn more about Groovy on the Groovy site and is project leader’s (Guillaume Laforge) blog. GRAILS is to Groovy what Ruby On Rails is to Ruby. Originally named “Groovy On Rails”, this name has been dropped in favor of Grails to avoid confusion/competition. Like Ruby on Rails, Grails is designed to create CRUD (Create Read Update Delete) Web applications. You can learn more about Grail on the Grails site and is project leader’s (Graeme Rocher) blog. Let’s now dive in the sample application, for this, as stated earlier I am using the sample application described in the OTN articles. Now we have installed the product, the next step is to create the application itself. 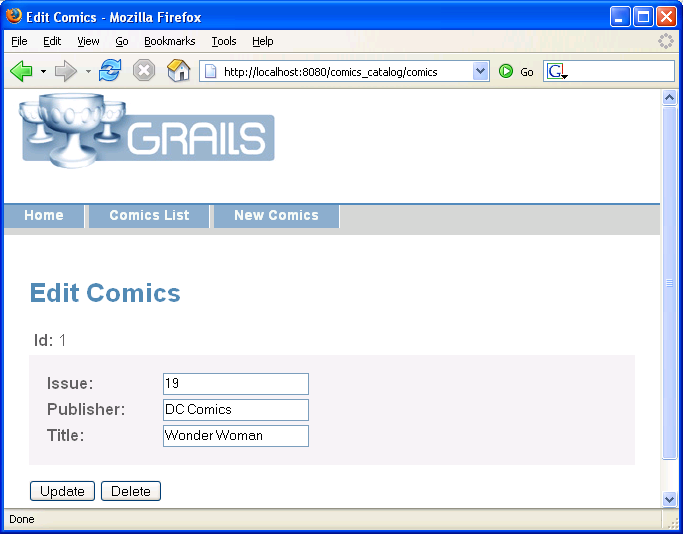 As you will see, Grails uses Ant intensively, the create-app command will ask you for an application name, enter for example comics_catalog. The created application contains now a list of directory allowing developer to start to build the application using Groovy, Grails and any Web components. One of the biggest differences between Grails and RoR, is the fact that the main components of your application development is not the Table like you have in RubyOnRails but the “Domain Class”. The domain class are the core of the business application, they contains the state and the behavior of your application. 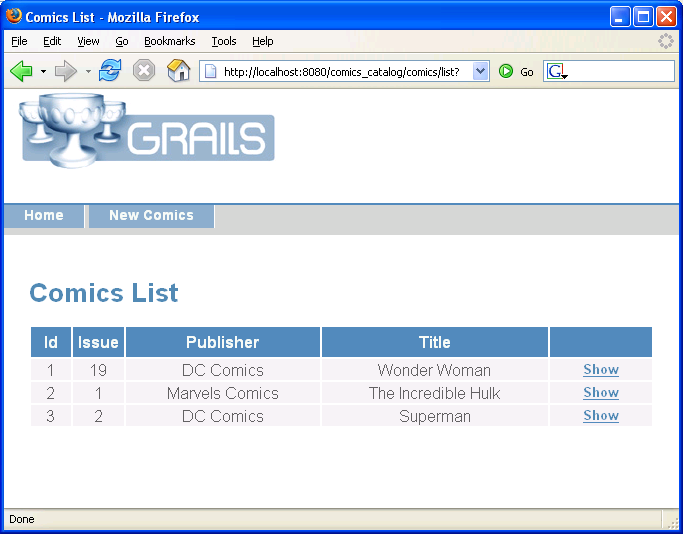 So the next step is to create a Domain Class for the Comics, to do that you just need to go in the home directory of your project, eg cd comics_catalog and run the create-domain-class. When the command ask you to enter the class name, enter comics. Grails, will not use the same naming convention that RoR has, so you need to use the same name for the class and the table you want to map your object on. The persistence layer is made using GROM (Grails Object Relational Mapping) that leverage hibernate. Note: In our case what we are doing is to leverage an existing database object and create the domain class at the top of it. Usually, Grails uses a different approach where everything is driven by the application, so you create the domain class first and then Grails will create the different database objects. We are all set, we are ready to run the magic command that will create the different screens and flow. You can now run the generate-all command to create all the different screens. 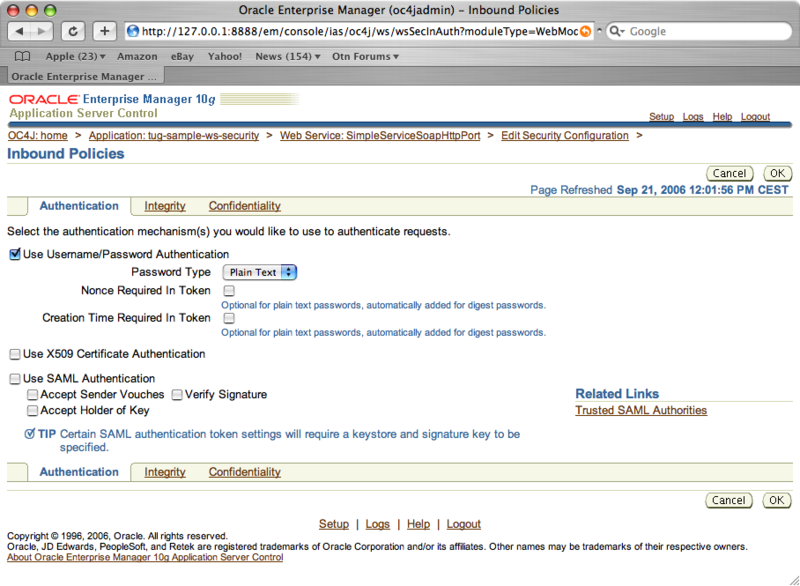 What we have to do is now to configure the application to use the Oracle database and schema. Let’s edit this file to connect to our Oracle database. @Property String url = "jdbc:oracle:thin:@localhost:1521:XE"
@Property String driverClassName = "oracle.jdbc.OracleDriver"
@Property String username = "ruby"
@Property String password = "ruby"
Nothing special concerning the properties such as URL, DriverClassName, username and password. The one that is interesting is the dbCreate, that allows you to configure the behavior on the schema to create or not objects.In our sample the table exists, so we want to reuse the object, but we want to be sure that we have all the mandatory objects, columns too, so I selected update. You can create a new entry by clicking on the “New Comics” tab, and view/edit/delete existing record by clicking on the “Show” link. If you take a look to this WAR you’ll see that it is quite big ~10Mb, this is because all the libraries are included in the Lib directory of the web application. You can see the exact structure of the WAR in the ./tmp (./comics_catalog/tmp/war) directory of the application. You can now administer and monitor the application like any other J2EE application deployed in OracleAS 10g. GRAILS like Ruby On Rails are really interesting frameworks allowing developers to create quickly Web application that access relational database and especially the Oracle Database. Grails is quite new (release 0.2), but the documentation is really nice and complete. I will encourage all developers that are interested by such framework to use it and provide feedback to the development team. I will try provide other post about deployment of Grails on OracleAS, but also related to other interesting features of this framework, for example Ajax support, Validations etc etc. When you develop applications that use SOAP based Web Services you very often use an HTTP proxy to capture the request and response that are exchanged between the clients and servers. For this you can use the Oracle HTTP Analyzer that is part of the toolset of Oracle JDeveloper, Axis TCP Monitor, or a packaged version of it that you have with Oracle BPEL Process Manager. BPELs are making extensive usage of SOAP messages, and it could be interesting to debug the different call to the partnerlinks. Oracle BPEL PM, to avoid HTTP calls and make optimized SOAP message when the partnerlink that you are invoking is deployed as a BPEL. So in the default configuration you do not see the different calls. In this article I explain how you can configure the server to be able to do it. By default the TCPMonitor launched from BPEL listens on the port 1234 and proxies for the default Oracle BPEL port 9700. So in this context you will capture all the requests is you access the server on the port 1234. It is not sufficiant here since the different partnerlinks endpoint are not dynamique and are set to the port 9700. So in this case you wont’s see the request coming from the BPEL to a local partner link (and I am not talking about the SOAP Optimization yet). One way that I use to work around this issue in development –may be we have more simple solutions, but this is the one that I use– is to change the port of the OC4J and make the proxy listening on the port 9700. In this case you will be able to capture the requests made from BPEL to its partnerlinks. Enter 9701 (or the value you entered for the HTTP port) for “Target Port #”. Click on the new tab “Port 9700”. If you have an error message like “java.net.BindException: Address Already in use: JVM_Bind” this is simply because your BPEL process manager is not stopped. In this case stop the BPEL server, and start the TCPMonitor by clicking the Start button. You can now go on the test page of the LoanFlow process (either on the port 9700 or 9701) and invoke the process. I am using 9701 since I want to capture the calls make by the Business Process to its partnerlinks. I was like you expecting to be able to see the different SOAP requests and response, but BPEL does some optimization around local SOAP calls. So to be able to capture these requests you just need to turn of this optimization. You arrive in the configuration tab, look for the optSoapShortcut property and set it to false. Click Apply You can now go on the test page of the LoanFlow process (either on the port 9700 or 9701) and invoke the process. I am using 9701 since I want to capture the calls make by the Business Process to its partnerlinks. Now you can see all the SOAP requests and responses between the LoanFlow BPEL and its partnerlinks. Google has published a new set of API (and format) to update and access data. It looks really interesting. These services are published using the REST paradigm and XML. When I was working in Oracle Consulting I was surprised to see how many customers are using character mode applications, base on Oracle Forms. Lot of applications in wharehouses, harbour, … are using telnet terminal, usually remote/mobile using RF networks. OracleAS 10_g/ADFprovides such support with the Industrial Telnet Server (ITS)_. ITS is the telnet server running in a J2EE container as a J2CA adaptor, and uses JavaServer Faces to render the user interface. The advantage of using JSF for the UI, it allows developer to leverage automatically different renderers (HTML, Mobile and telnet) without changing the application. Download the Beta version of the Oracle Application Server Developer’s Guide for Microsoft Office Interoperability along with sample code (and other technical resources) from this new OTN page. Windows Platform: Fusion Middleware is concurrently tested and delivered on Windows. .NET/Windows Server System Integration: Fusion Middleware offers broad integration with Microsoft .NET and Windows Server System at multiple levels. Office Interoperability: Fusion Middleware enables use of Office as the front-end for enterprise applications, as well as many ways to interact with enterprise information that can be read, parsed, and generated in Office-formatted documents. Oracle Fusion Middleware is now a certified platform for the SourceLabs “SASH” stack: Apache Struts, Apache Axis, the Spring Framework, and Hibernate. Visit this page to download free SASH software! Reconciles library versions and dependencies across the entire stack. Is rigorously tested according to the CERT7 method.